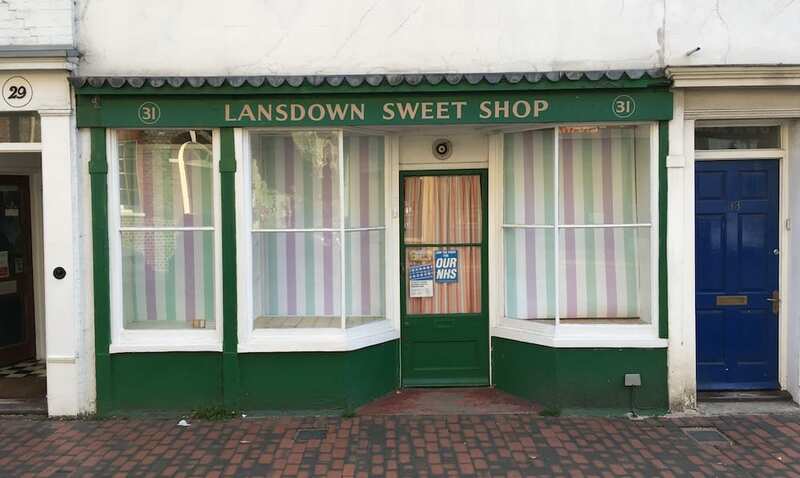 Invited to make a piece of work for SWEETSHOP, I started to think about how I could address some of my ongoing interests to the specificity of the site. One of these interests is the way in which painting is both a Fine Art and everyday practice, and I’ve made a number of works addressing the overlaps between the two (see the ‘DIY Paintings’ and the product information sheets for these at www.maryannefrancis.org/art.html. – which offer viewers the opportunity to rearrange house-paint coloured strips of mdf.) Using stripes again, this work more specifically references Daniel Buren, the artist who has made a career out of ‘paintings’ that are based on the design of shop-awning fabric. (Like his, my awning stripes are 8.7 cm wide). However, I also seek to extend Buren’s work by adding another colour to his palette which always involves white with one hue. In this way, the piece may also allude to the site’s former produce (think of acid drops), but also its more recent history as a place for looking at the intersection of politics and art; green and purple are equally the colours of the suffragette flag, which is being waved in a centenary celebration this year. Home, as it happens it is.